Growing up, my family would typically go to my Aunt’s house for holiday dinners. I remember looking forward to spending time with my cousins, three girls around my age. We always had a grand ole’ time laughing and playing together. I didn’t even mind helping out with the dishes after dinner although I remember being shocked the first time my Aunt insisted I help her daughters with this task. I was a guest, or so I thought ever so indignantly. If doing the dishes was their chore, I wondered why I should have to help. Fair enough. Respect your elders and all that jazz. It was still girl time and we were in it together. Plus, I’ve come to appreciate the lessons my Aunt tried to teach me about good manners. This guideline works for me. Although please note that Post says nothing about offering to help in the kitchen being a requirement. And here’s another caveat regarding the close friends/relatives category… Why does it seem that only female friends and relatives are expected to help in the kitchen? Emily Post doesn’t explicitly say this but it’s been my observation that some perfectly well-functioning husbands and sons can rinse a dish in their own home but at a friend or relative’s house, they lose all inclination to help clean up after a meal. They just stumble off in a food coma to some area of the house to watch TV or discuss the weather while the women clean up the dishes–in 2015!! But then, I wonder, do I ask enough of my own sons? They are expected to help set and clear the table at home, empty the dishwasher and occasionally wash glassware they’ve used in our rec room kitchenette. But I don’t ask my sons to clear the table or wash dishes after a meal served at anyone else’s home. Nor have I ever expected other people, let alone their children, to clean up after dinner at my house. And truth be told, I kind of resent being expected to do so by others. To my mind, offering to help is polite but not offering to help isn’t necessarily impolite. And being aggrieved when someone doesn’t offer to help might be the epitome of a discourteous hostess. But I digress. More to my point, should I be more like my Aunt when it comes to expecting perfectly capable young people, regardless of gender, to make an effort to clean up after a meal at someone else’s house? Should other parents be asking their kiddos to help clean up after a meal at our house? 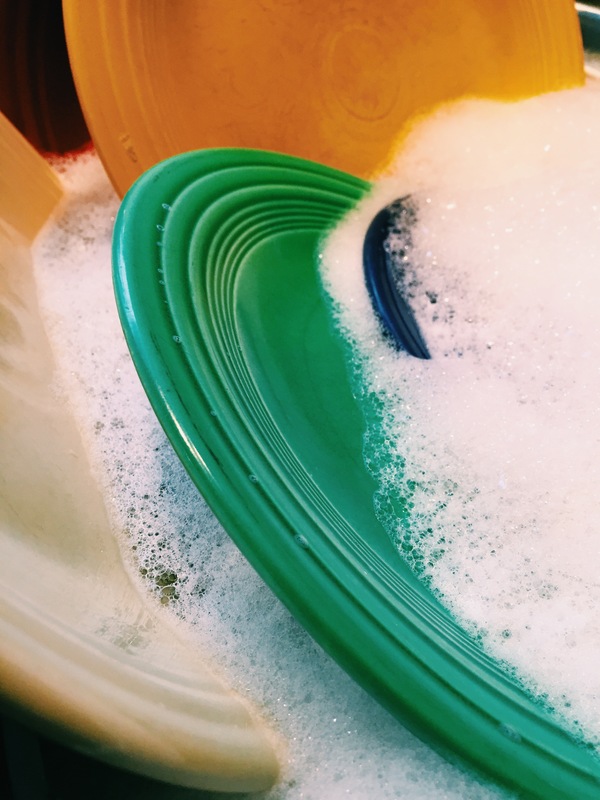 I remember a friend who was once flabbergasted when her college-age son returned home on break and would pile up his dirty dishes on the counter like one would on a conveyor belt in a student cafeteria. She was frustrated that he didn’t rinse his dishes or attempt to put them in the dishwasher. Bewildered, I asked if his behavior had changed since going off to college. Was college life somehow ruining all the good habits she’d instilled in him? But she said, “no.” He was never expected to do dishes while living at home. But she assumed he’d matured enough to figure it out. Wait. What? I’m not waiting. I want my sons to have a basic understanding before leaving home about what’s expected in regard to kitchen detail. But what exactly is expected of anyone? And also, I want to be the kind of mom who occasionally takes care of her sons in a way they’ll appreciate and maybe even long for someday. So must I always insist they clean up their own mess? Where’s the line? Is there a line? And which way do the friggin’ forks go in the dishwasher?? Thanks so much Nina. I truly appreciate your encouragement since it’s often easy for me to keep my nose glued to my computer screen always working on all things Edina Mag, that I don’t explore other writing/speaking/reading opportunities near enough. Angela, as always, loved this one. I do think it is important to teach our children the importance of at least asking if they can help. I have three daughters, two out of the three are pretty good at it. Not bad! I still don’t know which way to put the fork!